AllegroMedical.com presents The Labrada Nutrition Lean Body - Vanilla Ice Cream Protein Supplement. Build Muscle! Burn Fat! Hi-Protein Meal Replacement Shake. Stimulate Muscle Growth! Get Stronger 6000mg BCAA, Recover Faster 7000mg Glutamine, Get Leaner! 7000mg EFA-PLEX-EFAs. Lean Body Hi-protein meal replacement shake is the quick nutrition solution for hard training athletes who have little time to prepare meals. Forget other supplement pills and powders. You get it all in Lean Body: Concentrated muscle-building, fat-burning nutrition in one delicious, easy to make shake. Incredible taste! 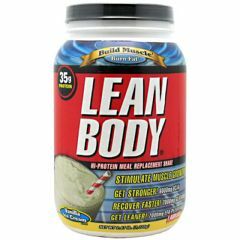 Lean Body is the best tasting meal replacement powder (MRP) ever made. That's why the American Culinary Institute awarded Lean Body its Gold Medal Taste Award for five years in a row. 50/30/20 (protein/carbohydrate/fat) ratio of macronutrients consisting of highly bio-available, time-release proteins, high-fiber complex carbohydrates, and essential fatty acids, to support lean muscle growth, strength, and higher energy, all day long! 35g of LeanPro proprietary blend of fast-release and slow-release proteins, to give you a sustained flow of vital amino acids to support intracellular nitrogen retention levels for faster muscle growth and strength increases. Over 6,000mg of BCAA's (Branched Chain Amino Acids) per serving. BCAA's have an anti-catabolic effect (prevents muscle tissue breakdown.) Contains 21 Vitamins and Minerals. Over 7,000 mg of Glutamine and Glutamic Acid. Studies show that supplemental glutamine can also prevent muscle breakdown. 21 grams of an advanced blend of complex carbohydrates to help stabilize your blood sugar and insulin levels, to promote greater energy and fat burning. 7 grams of FiberPlex dietary fiber per serving, from Fibersol-2, providing 28% of the RDA for fiber to support superior intestinal and cardiovascular health. 7 grams EFA-Plex containing natural-source omega-3 and -6 fatty acids, medium-chain triglycerides, flaxseed oil, and borage oil. No Maltodextrin. No Aspartame, No Trans fat, No Artificial Colors or Preservatives. Glass- Fill glass with 10 oz. of water or your favorite beverage. Add 2 scoops (70g) of Lean Body, and mix with a spoon. Shaker- Fill shaker with 10 oz of water or your favorite beverage. Add 2 scoops (70g) of Lean Body, cover and shake; BlenderFill blender with 10 oz. of water or your favorite beverage (for a creamy ice cream flavor add a handful of ice cubes.) Add 2 scoops of Lean Body, cover and blend for 20-30 seconds. Before Workouts- Take Lean Body 1-1/2 hours prior to working out to keep muscles supplied with nitrogen-promoting amino acids and provide nutritional support to prevent muscle breakdown. After WorkoutsTake Lean Body within 30 minutes of your workout to jumpstart muscle repair, growth, and increase muscle glycogen (fuel) stores. Before BedtimeTake Lean Body 1 hour prior to bedtime to ensure a steady supply of muscle-building nutrients all night long. LeanPro (Cross Flow Micro Ultrafiltered Whey Protein Concentrate, Soy Protein Isolate, Cross Flow Micro Ultrafiltered Whey Protein Isolate, Milk Protein Isolate, Glutamine Peptides), EFA Plex (Sunflower Oil, Creamer [high oleic sunflower oil, corn syrup solids, sodium caseinate, mono- and diglycerides, Dipotassium phosphate, Tricalcium phosphate, soy lecithin, tocopherols], mct oil, flaxseed oil, borage oil), Fiber Plex (Polydextrose, Fibersol 2 Fiber, Cellulose Gum, Oat Flour, Rice Bran), Natural and Artificial Flavors, Vitamin and Mineral Blend (Di-Calcium Phosphate Magnesium Oxide, Ascorbic Acid, Vitamin E Acetate, Niacinamide, Electrolytic Iron, Zinc Oxide, D-Calcium Pantothenate, Pyridoxine Hydrochloride, Copper Gluconate, Riboflavin, Vitamin A Acetate, Thiamin Mononitrate, Folic Acid, Potassium Iodide, Cyanocobalamin), Fructose, Salt, Sucralose, Acesulfame Potassium.